A healthy gypsy moth caterpillar on a leaf. Outbreaks of gypsy moths damage roughly 1 million acres of forest in the U.S. each year. Scientists say they have figured out how a very clever virus outwits a very hungry caterpillar. The caterpillar is the gypsy moth in its larval stage, and the invasive species damages roughly a million acres of forest in the U.S. each year by devouring tree leaves. But the damage would be greater if it weren't for something called a baculovirus that can infect these caterpillars and cause them to engage in reckless, even suicidal behavior, scientists say. The virus is so effective that the government actually sprays it on trees to help control gypsy moth outbreaks. Now a team of scientists thinks they have discovered how the baculovirus takes control of gypsy moth caterpillars. The key is a special gene that's carried by the virus and affects the caterpillar's eating behavior, according to the team's new study in Science. The discovery explains a phenomenon scientists have wondered about for decades. Normally, gypsy moth caterpillars feed on tree leaves at night when predators including birds and squirrels can't see them. Then during the day, the caterpillars climb down and hide in the tree bark or even under leaves on the ground. "As they get sick they climb up to elevated positions and stay there and die," she says. What happens next is pretty gruesome. "The inside of the caterpillar gets pretty much converted to millions and millions of virus particles, then there are other enzymes that cause the exoskeleton to melt. And that liquefies the caterpillar and then it can rain virus down on the leaves below." When other caterpillars eat those leaves, they get infected too. Hoover and a team of researchers suspected that the virus was taking control of the caterpillar by using a gene involved in molting, which the gypsy moth larvae must do several times as they grow. The gene also affects eating behavior because in order to molt, larvae must stop eating. To test their hypothesis, the scientists infected some caterpillars with a baculovirus that carried the normal version of this gene and other caterpillars with a baculovirus carrying an inactivated version of the gene. Then they put the caterpillars in tall plastic containers lined with a screen. "Every time the caterpillars were infected with the normal gene they would die at an elevated position in the container," Hoover says. "If the gene was knocked out, they didn't." Caterpillars infected with baculovirus climb to the tops of trees, where they melt and drip the virus onto the foliage below. There, it's eaten by other caterpillars. That's probably because this gene disrupts a hormonal system that tells the caterpillar when to stop eating," Hoover says. "And to feed you need to be up in the tree." The result is devastating for the gypsy moth, but great for the virus, says David Hughes, an entomologist and biologist at Penn State and a co-author of the study. So if you look at the world from the point of view of a baculovirus, it's easy to see how it would have evolved to carry this gene. "The most important challenge for a virus is outcompeting other viruses," Hughes says. So a virus that could make its host die in a place that spread the infection to other hosts would have a big advantage, he says. Other scientists say the finding reveals just how clever a pathogen can be. "Who knew that a virus would be able to manipulate the behavior of its host?" says Jim Slavicek, a research biologist with the U.S. Forest Service, who also contributed to the new study. Slavicek says knowing precisely how baculovirus overwhelms the gypsy moth could help scientists develop more potent strains of the virus. It could also help them determine when in the gypsy moth's life cycle it is most vulnerable to infection. And he says all that could help bring down the cost of spraying with baculovirus. Right now, he says, land managers often use cheaper methods, such as insecticides or a deadly fungus. "The advantage of the virus is that it is specific for gypsy moth larvae, and so it will impact no other animal, insect, plant in the treatment zone." Gypsy moth outbreaks in the U.S. are less severe than they were a couple of decades ago, thanks to better treatments, Slavicek says. But he says the pest remains a major threat that can leave a forest bare in a matter of weeks. During an outbreak, Slavicek says, there are so many caterpillars that their remains make some roads so slippery that road crews have to apply sand. And if you drive on those roads at night, he says, "millions of moths will fly to the car and it can be so dense that it's like a snowstorm. You can't see what's in front of you." A monster 21-foot (6.4-metre) saltwater crocodile, believed to be the biggest ever captured, has been trapped in the southern Philippines after a spate of fatal attacks, officials said Tuesday. The 1,075-kilogramme (2,370-pound) male is suspected of eating a farmer who went missing in July in the town of Bunawan, and of killing a 12-year-old girl whose head was bitten off two years ago, crocodile hunter Rollie Sumiller said. The hunter examined the crocodile's stomach contents by forcing it to vomit after it was captured Saturday, but there was no trace of human remains or of several water buffaloes also reported missing by locals. "The community was relieved," Sumiller said of the capture, but added: "We're not really sure if this is the man-eater, because there have been other sightings of other crocodiles in the area." The local government of the impoverished town of 30,000 people has decided against putting down the reptile, and will instead build a nature park where it will go on display. Josefina de Leon, wildlife division chief at the Philippines environment ministry, said the beast was likely the biggest crocodile ever captured anywhere in the world. "Based on existing records the largest that had been captured previously was 5.48 metres long," she told AFP. The Philippine specimen would easily dwarf the largest captive saltwater crocodile, which the Guinness World Records website lists as Cassius, a 5.48-metre (18-foot) male which lives at an Australian nature park. Press reports also describe other huge crocs including a 6.2-metre (20.3-foot) adult male killed in Papua New Guinea in 1982 that was measured after it was skinned. The Bunawan hunting team, employed by a government-run crocodile breeding farm, began laying bait using chicken, pork and dog meat on August 15 in an attempt to snare the beast. But the reptile, which measured three feet (0.91 metres) across its back, simply bit off both the meat and the line it was skewered on. It was the team's second attempt after a failed expedition launched in response to the fatal 2009 attack. Beyond the mark of the hook inside its upper jaw, the crocodile did not appear to have sustained any serious injuries, Sumiller said. Bunawan Mayor Edwin Cox Elorde said the government would build a nature park showcasing the giant crocodile and other species found in the vast marshland on the upper reaches of the massive Agusan river basin on Mindanao island. "It will be the biggest star of the park," Elorde told reporters. Sumiller said the plan was the best option available for the creature. "He's a problem crocodile that needs to be taken from the wild... and used for eco-tourism," he said. Crocodylus porosus, or the estuarine crocodile, is the world's largest reptile. It grows to five or six metres in length and can live up to 100 years. While not considered an endangered species globally, it is "critically endangered" in the Philippines, where it is hunted for its hide which is used in the fashion industry, de Leon said. "There have been very few sightings of porosus in the wild in the Philippines in recent years," she added. In July, a saltwater crocodile measuring almost 14 feet (4.2 metres) was caught on the western Philippine island of Palawan after it killed a man. 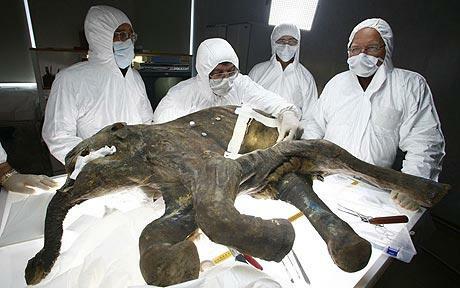 Lyuba, named after the wife of the hunter who discovered her is the most complete woolly mammoth specimen ever found. The 40,000-year-old carcass was perfectly preserved and has been described as a "sensational" find. 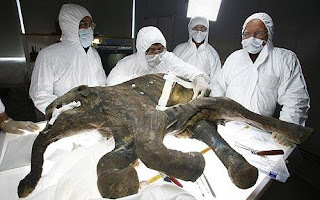 Scientists will now fly the mammoth's remains to the regional capital Salekhard, where it will be stored in a cooler to prevent the remains from decomposing. Giant woolly mammoths have been extinct since the Earth's last Ice Age 1.8 million to around 11,500 years ago. Arctic ice kept the extinct specimen so immaculately preserved that her skin and internal organs were intact and she even had food inside her gut! A close relative of the deadly Red Back Spider of Australia Latrodectus hasselti, the Mediterranean Black Widow Latrodectus tredecimguttatus (Rossi, 1790) is just as notorious. Known as the ‘Viuda Negra’ in Spanish, the female is easily recognised; a glossy black spider with pea sized abdomen, usually with red bars or spots and a leg span of around 25mm. The male is slightly smaller. Widow spiders are mainly nocturnal, spinning sticky tangle webs in which to catch their prey. Once caught, the widow injects lethal venom that quickly kills its victim before eating it. They usually prey upon insects like crickets, but are able to overpower larger prey such as scorpions by wrapping them in gummy silk. Latrodectus tredecimguttatus is considered the most dangerous spider in Europe. 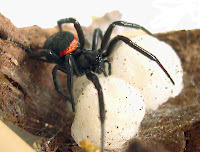 Other species of Latrodectus to occur in the Mediterranean region include Latrodectus hystrix, Latrodectus lilianae, the White Widow Latrodectus pallidus and the Brown Widow Latrodectus geometricus which are not as venomous. Symptoms Envenomation is followed by excruciating pain known as ‘Latrodectism’. The neurotoxic venom quickly attacks the nervous system. Symptoms can include headache, nausea, sweating, fever, temporary blindness, vomiting, abdominal cramps, hypertension, paresthesia, asphyxiation, tachycardia and respiratory failure which can in extreme cases lead to death. First Aid Most victims are usually bitten on their hands or arms; these should be kept below the heart level and the patient be immobilised until help arrives. Medical attention should be sought immediately. It is important that doctors are advised of the identity of the spider using this field guide. The severity of the condition will depend on the amount of poison inoculated and the health of the victim. Sometimes very little or no venom is injected resulting in a ‘dry bite’ although some victims may require treatment for shock. The False Black Widow Steoda paykullianus (above) resemble the more venomous Black Widows. They similar in size, glossy black with either a red, white, yellow or orange band at the front of the abdomen. The similar looking S grossa is uniform black, whilst S bipunctata is glossy brown with variable white markings. The False Widow Spiders (Steoda) are mildly venomous to humans. ARACHNOPHOBIA is the fear of spiders, and is the most common phobia among humans; 1 in 3 people affected! Arachnology is the study of spiders and arachnids, those who study spiders and related animals are called Arachnologists. There are over 35,000 known species of spiders and an estimated 35,000 yet to be identified. Only a small number of spiders are actually Dangerous; even venomous species rarely bite people. Cars are statistically more dangerous than spiders! Spiders are very beneficial to our eco-systems, as they prey upon disease carrying insects and household pests. Spider silk is the strongest natural fibre known to science, over six times stronger than steel! Read all about the Poisonous Creatures of the Mediterranean - Bites, Treatments & Identification. Available from all leading book stores and online. 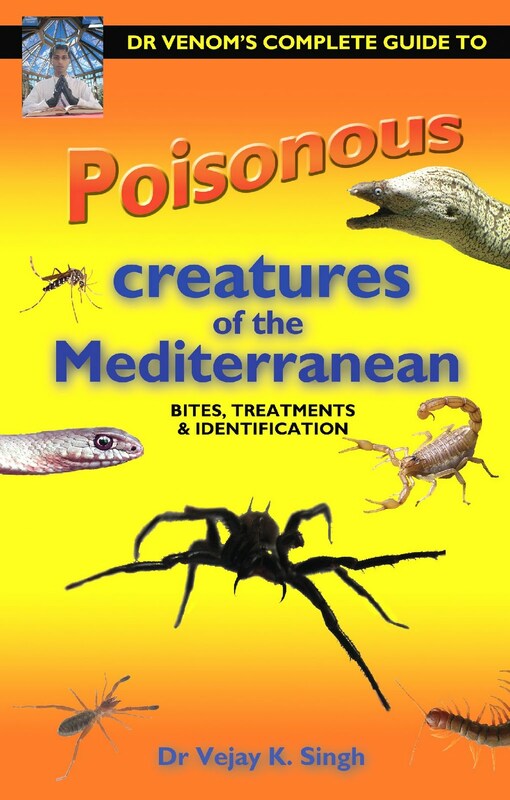 All Poisonous and Medically significant species of spiders, insects, reptiles, amphibians, centipedes and marine animals of the Mediterranean & Europe.